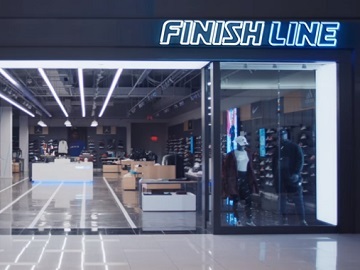 Caleb McLaughlin stops back into the Bodega to catch up with some old friends and make some new ones in the latest Finish Line commercial. The 17-year-old actor, known for his role as Lucas Sinclair on the hit Netflix Original series Stranger Things, stars in the new ad released by the retailer. Opening the door of the Finish Line Fresh corner store, he finds Quavo, Offset and Takeoff of the Migos running the place. He asks them if they’re open and the answer he gets is affirmative. Former football wide receiver Jerry Rice, who played in the National Football League, also makes a special appearance. At the end of the commercial, an onscreen line urges viewers to watch Migos perform from Atlanta at halftime. promoting the Nike Air Max 270.